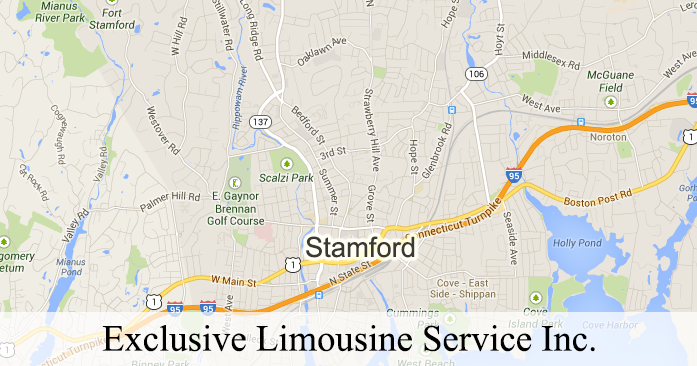 Located in Stamford, Serving all of Fairfield County. When you’re traveling to New York’s LaGuardia, Kennedy and Newark airports, you can rely on us to get you there on time and without hassle. Whether your business is located along Putnam Avenue, in Greenwich Office Park or in one of the suites on Steamboat Road, Exclusive Limousine Services Transportation System provides the most convenient way to travel. If you are arriving on an in-bound flight, you can choose from in-terminal or express curbside pickup. Regardless of what you choose, you can always rely on your Exclusive Limousine Service chauffeur to be awaiting your arrival. No need to WORRY if your plane is behind or early a few minutes – with real-time flight tracking, your chauffeur is able to know exactly when you will be arriving. With Exclusive Limousine Service, you don’t have to worry about arriving late to your destination. You can rest easy knowing that your friendly chauffeur will always be waiting for you a few minutes early. Your limo or sedan will be clean and fully stocked with bottled water. We make sure you can make the most of your trip by either catching up on work or taking a quick nap. Make your big day even more special with one of our elegant limousines. Whether you will be celebrating at The Hyatt, Riverside Yacht Club or Greenwich Country Club, or a catered event under the tent at your beautifully landscaped estate on the Sound or in backcountry Greenwich, Exclusive Limousine Service pristine wedding limousine will add that extra touch of magic. With our spacious vehicles, you won’t have to worry about wrinkling your dress. Booking a safe evening of limousine travel for a child’s special birthday or the Greenwich High School or Brunswick prom? Give us a call, and we will take care of everything. From Cos Cob and Old Greenwich to Byram, Greenwich is home to a wealth of choices for that important business lunch. A table at Jean-Louis, or one of the town’s other prestigious restaurants, can help close a business deal with a prospective client. Complete your presentation by providing transportation in a Greenwich, CT, limo or chauffeured sedan from Exclusive Limousine Service. Enjoy a special evening out on the town without having to worry about driving home late or wasting time trying to find parking. Exclusive Limousine Service Greenwich, Connecticut car service is a fun way to travel into Manhattan or your benefit at the Bruce Museum. No matter what time of day or night you need to be on the road, you can book your ride 24/7 online or call our reservation agents. They’re familiar with changing regional traffic patterns and current travel advisories and can advise you just how much time you need to allow for your trip. Award-winning Exclusive Limousine Service Transportation System is a select provider of chauffeured limousine and corporate car service for Greenwich, CT, executives and companies. Exclusive Limousine Service is an industry leader in the use of innovative technologies that raise the bar for chauffeured ground transportation. Discover the Exclusive Limousine Service Experience” the next time you’d like to travel .